Battery features: 7.2V 1350mAh. Batteries work with Canon EOS 77D, EOS 750D, EOS 760D, EOS 8000D, EOS M3, EOS M5, EOS M6, EOS Rebel T6i , EOS Rebel T6s, EOS Rebel T7i, Kiss X8i Camera. 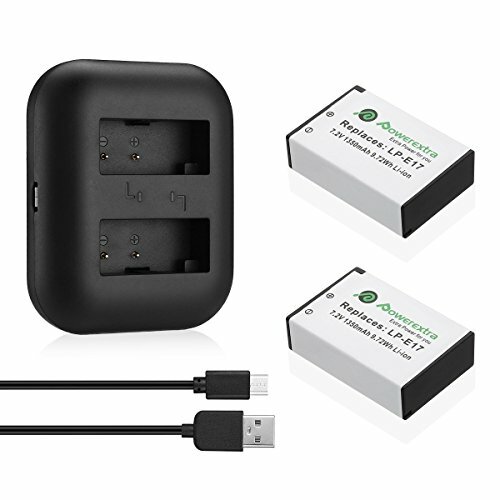 Dual charger features: 5V / 2A input and 8.4V / 0.8A output. Come with USB cable, you can anytime charge the battery by power bank on the go. Advanced technology: With precision decoding circuit board, the camera will not prompt our battery is not a genuine battery when you put replacement Canon LP-E17 battery in the camera. Fully Decoded ( no queries and they show power level indication ): only in Canon EOS Rebel T6i, Rebel T6s, Rebel T7i, 750D, 760D, 8000D, Kiss X8i, 800D, 77D, 200D, EOS SL2 Camera. Non-Decoded ( no queries but the power level indicator is not displayed): in Canon EOS M3, EOS M6, EOS M5 camera. But batteries must be charged with Powerextra charger. Powerextra charger also can charge the original canon LP-E17 batteries. Includes: 2 Replacement Canon LP-E17 Batteries + Dual Charger + USB Cable + MicroFiber Cleaning Cloth.